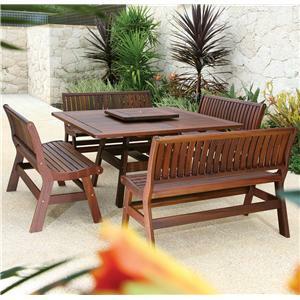 You can have a solid piece of craftsmanship in your outdoor space with this handsome five-piece set. The square-shaped table carries a a strikingly beautiful chocolate brown finish and features a single pedestal, which creates a balance of strength and elegance. Plus, crafted from 100% FSC® certified Ipé Wood, the table has a very high wear durability that's fantastic against the weather. Meanwhile, the matching benches have a slight sloped seat that's shaped for your comfort. You'll be set with this trestle table and bench set in your backyard. The rectangular-shaped piece carries a strikingly beautiful chocolate brown finish and features a trestle base, which creates a balance of strength and elegance. Two Lincoln backless benches offer tons of seating space for your family and friends. Plus, crafted from 100% FSC® certified Ipé Wood, the each piece has a very high wear durability that's fantastic against the weather. 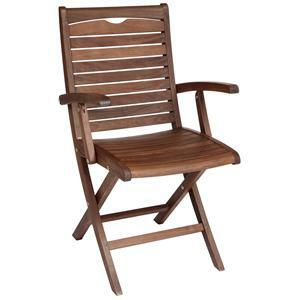 You'll have an attractive addition for your outdoor table with this arm folding chair. The piece carries a gorgeous brown finish and features a fan-designed back, slightly sculpted seat and top hole for easy moving. Plus, crafted from 100% FSC® certified Ipé Wood, the table has a very high wear durability that's fantastic against the weather. Simple, yet, stunning, this arm chair is sure to leave you pleased. You'll be set with this folding table in your home decor. The piece carries a warm brown finish and features a slitted panel back and matching seat, which folds, allowing for easy storage. Plus, crafted from 100% FSC® certified Ipé Wood, the table has a very high wear durability that's fantastic against the weather. You'll be set with this folding chair in your home. 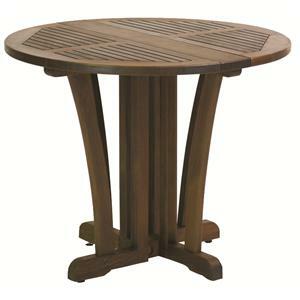 You can add a pleasing addition to your backyard with this pedestal table. The round-shaped piece carries a strikingly beautiful chocolate brown finish and features a single pedestal, which creates a balance of strength and elegance. Plus, crafted from 100% FSC® certified Ipé Wood, the table has a very high wear durability that's fantastic against the weather. You'll have the perfect location for friends and family to set down beverages or chat away with this round table in your home. 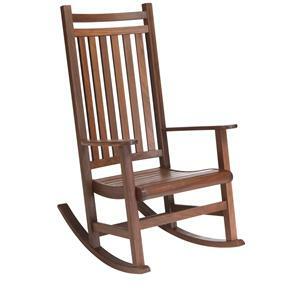 Bring a welcoming touch to your home decor with this beautiful outdoor rocking chair. 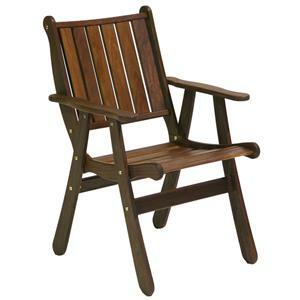 The piece carries a warm brown finish and features a slat back as well as slightly sloped seat while the rocking motion will provide your with serenity made for a lifetime. Plus, crafted from 100% FSC® certified Ipé Wood, the table has a very high wear durability that's fantastic against the weather. Make your home complete with this wood glider. 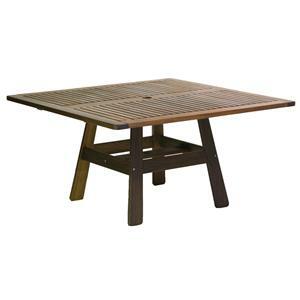 You can have a solid piece of craftsmanship in your outdoor space with this handsome table. The square-shaped piece carries a a strikingly beautiful chocolate brown finish and features single pedestal, which creates a balance of strength and elegance. Plus, crafted from 100% FSC® certified Ipé Wood, the table has a very high wear durability that's fantastic against the weather. 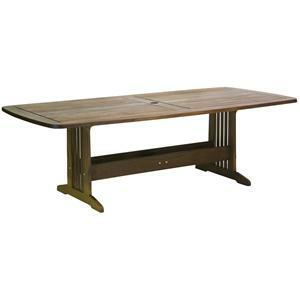 Make your outside home just as nice as your inside home with the addition of this stunning table. You'll be set with this trestle table in your backyard. The rectangular-shaped piece carries a strikingly beautiful chocolate brown finish and features a trestle base, which creates a balance of strength and elegance. Plus, crafted from 100% FSC® certified Ipé Wood, the table has a very high wear durability that's fantastic against the weather. 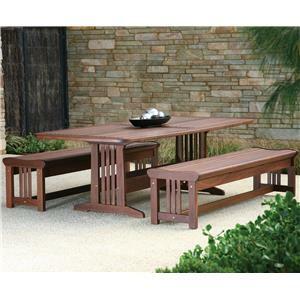 Create a wonderful location for your friends and family to gather with the addition of this outdoor trestle table. Bring a handsome addition to your outdoor table with this beautiful bench. The piece carries a stunning chocolate brown finish and features a slat designed back as well as a slightly sleighed seat shape. Plus, crafted from 100% FSC® certified Ipé Wood, the table has a very high wear durability that's fantastic against the weather. Make your outdoor setting complete with help from this bench. 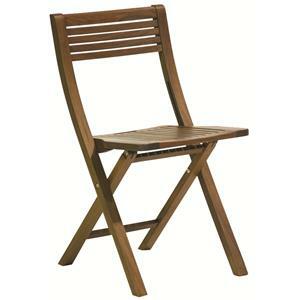 You can add a nice touch to your home decor with this folding chair. 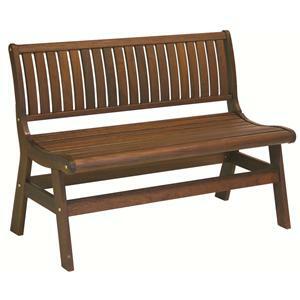 The piece carries a stunning chocolate brown finish and features a slat designed back as well as a slightly sloped seat shape. Plus, crafted from 100% FSC® certified Ipé Wood, the table has a very high wear durability that's fantastic against the weather. The chair also folds for a space-saving storage option. Make your yard as welcoming as your home with the addition of this outdoor chair. For fifteen years, the Jensen name has been synonymous with thoughtful design, solid craftsmanship and a high standard of customer service. Now, Jensen has brought the full range of its experience to bear in masterfully constructing its new line of furniture, made from FSC-certified Ipé (EE-pay) wood. With an impressive range of traditional and modern designs, and styles that have stood the test of time, Jensen offers something for every home. A strikingly beautiful chocolate brown color, Jensen Ipé weathers with strength and elegance. Ipé is incredibly strong and dense, with very high wear durability. It resists splintering and check¬ing, as well as rot, decay, insects, mold and even fire—naturally. Weather has little to no negative effect on Ipé. A handsome chocolate brown when new, the sun gracefully transforms Ipé to a mature, elegant silver patina. By using only FSC-certified wood, Jensen Leisure Furniture is working to maintain the long-term well-being of the forests and the people who depend on them. The Ipé used in Jensen Leisure Furniture is certified to meet criteria of the Forest Stewardship Council (FSC), a non-profit organization that sets international standards for responsible forestry. By sourcing materials in this manner, Jensen Leisure Furniture is helping to conserve the rainforest and enhance the standard of living in its surrounding communities.